Over the weekend, Spider-Man: Homecoming became Sony’s second-largest opening ever, pulling in an impressive $117 million and being on track to ultimately make $300 million at the domestic box office alone. With that financial win in its pocket, Sony finally has to feel confident again about Spidey’s cinematic future. But as much as audiences have responded positively to Tom Holland’s performance, Sony—and Marvel—have to bear in mind that, after three different franchise reboots in 15 years, Spider-Man fatigue is still a very real thing. More specifically, Peter Parker fatigue is a real thing. If Sony wants to keep the momentum going, it’s going to have to become bigger than Peter Parker or Peter’s classic villains. Sony needs to tap into the Spider-Verse and give Peter a team of his own. 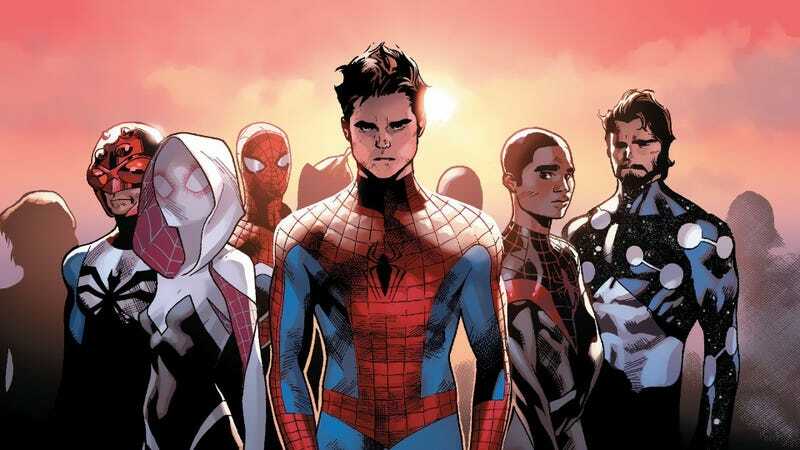 One of the key differences between Sony and Marvel’s latest take on Spider-Man and his previous cinematic incarnations is the simple fact that this Peter Parker’s established as being a team player straight out of the gate. Introducing Spider-Man in Captain America: Civil War wasn’t just a clever choice to stoke interest in a movie that was already stacked with characters, it set a template for what kind of role he could play in future Marvel films. We know that Peter’s going to manage to get in a few quippy one-liners during Infinity War, but at the end of Homecoming when Tony offers Peter a chance to join the Avengers full time, he turns the offer down in favor of remaining a friendly neighborhood Spider-Man for a while longer. Yeah, it’s a charming scene that shows his maturity and just how new to superhero-ing Peter is, but here’s the thing about New York City: it’s huge. Even if Peter left Manhattan to the Defenders and only tried to cover his own stomping grounds in Queens, it’s still the largest borough in NYC at 178 square miles, and with about 2.3 million residents. Most of the criminals that Peter comes up against are two-bit thieves and street toughs, sure, but Spider-Man’s rogues gallery of legitimately dangerous super villains rolls very deep, and Homecoming’s mid-credit scene hints at the origins of the Sinister Six. It won’t be long before Peter comes face to face with Venom, Mysterio, and Scorpion, but unlike in Sony’s other Spider-Man films, he shouldn’t have to face them alone. It still stings more than a little that Sony chose to make yet another movie about Peter Parker when, in the comics, Miles Morales is arguably a more contemporary embodiment of Spider-Man’s traditional character. But in a very purposeful way, Homecoming makes a point of acknowledging that Miles is alive and well somewhere within Marvel and Sony’s shared universe—and he isn’t the only Spider-hero the film subtly references. Though she’s never named on screen, one of Peter’s fellow mathletes is an Asian-American girl, portrayed by actress Tiffany Espensen, who is credited as “Cindy.” In Marvel’s books, Cindy Moon is Peter’s classmate who’s bit by the same irradiated spider that gives him his abilities and eventually goes on to become the hero Silk. Homecoming doesn’t establish whether or not Gwen Stacy exists, but it stands to reason that she (and her alt-universe alter-ego Spider-Gwen) could reasonably be introduced in subsequent films. Going forward, Sony’s going to need a way to set up its own major tentpole Spider-Man movies that don’t directly involve characters that Marvel owns, like Iron Man and Happy Hogan. In order to really stand on its own and prove that it can build out a cinematic universe related to, but distinct from Marvel’s, Sony has to be able to create Avengers-like stakes all on its own. We’ve seen Spider-Men go up against multiple villains in the past, and while some of those showdowns have been fun to watch, in a way, they’re all retreads of the “with great power comes great responsibility” aphorism that doesn’t need to be uttered on screen yet again. We’ve seen multiple Spider-Man flicks from Sony that are just about Peter vs. the Bad Guys, so why not go for something a little bit different and give Peter the kind of companionship that everyone needs to make it through high school? The raw material and potential’s already there—all Sony has to do is spin it together into something great.